Designated Pick Up / Drop Off areas have been updated for your convenience. Auto, taxi, limo and ride share users can be dropped-off and picked up at the locations outlined below. Lyft is the official ride share technology partner of Barclays Center. To book a ride, please download the Lyft mobile application. 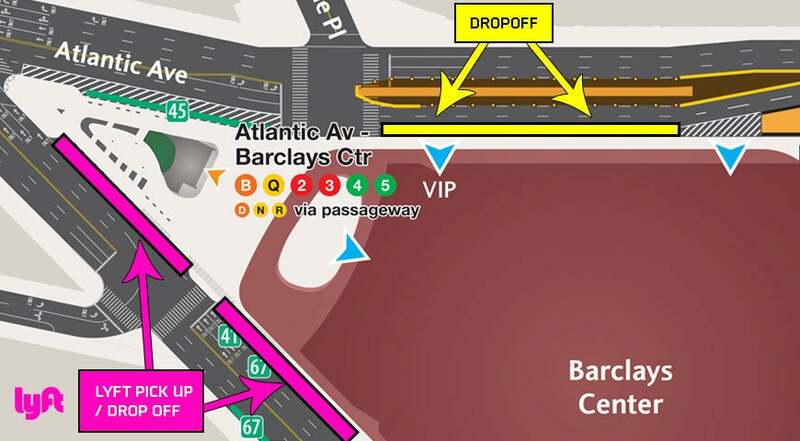 Please note, there is limited space for drop off and pick up surrounding Barclays Center and we encourage our guests to use public transportation. Construction in the area may affect your travel time to the venue. Please click here for details surrounding ongoing construction around Barclays Center.